The diverse ecosystems that are found in soil determine the productivity of the land. Without the billions of bacteria, millions of fungi and protozoa and the thousands of other critters living under our feet, we would be hungry. This micro-community transfers nutrients through the soil, makes other nutrients into forms plants can use and helps protect crops from soil-born pathogens. The very structure and health of land is directly influenced by this complex set of biological and chemical interactions which decompose, retain and recycle nutrients within the soil—and all of the food web organisms have their roles and functions. Who is Part of the Ideal Soil Community? Different groups of critters do different things in the soil. For example, bacteria and fungi take nutrients from the soil which are ‘non-available’—plants can’t use them—and retain the nutrients as they grow. Their waste products from the decomposition of plant material or residues also retain those nutrients in non-leachable forms. The bacteria and fungi are then consumed by predators, releasing soluble—plant-available—nutrients and making them usable for crops. Bacteria also builds microaggregates—the smallest units of soil structure. Think of the soil as a city being built. Microaggregates are the bricks, fungi are the mortar that binds the bricks and larger organisms, like protozoa, nematodes and microarthropods, are the building constructors. All these organisms congregate around plant roots acting as a wall, protecting the roots from disease organisms and pests. Bacteria: Recognized by its round- or rod-shape and motion. They are vital for recycling nutrients. 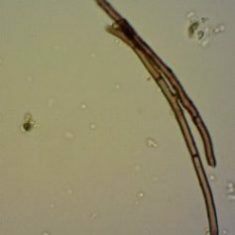 Some filamentous bacteria are required for the growth of some plants while they are detrimental to the growth of other plants. Fungi: A fungal hyphae can be distinguished by its strand-like appearance with straight cross walls. A hyphae should be uniform in diameter and no less than two micrometers thick. The best hyphae are those that are wide in diameter and dark in color. These networks of the soil food web help to hold and transfer nutrients directly to plants through symbiotic relationships. They also promote healthy soil aggregation. Fungi-Bacteria (F:B) Ratio: Good soil is not just the presence of different species of beneficial fungi and bacteria, but the ratio of the overall biomass of the two organism groups. This is crucial because different plant communities require different F:B ratios. For example, weeds require a soil with lots of bacteria whereas forests require much more fungi. Predators: There are far fewer predators in soil than there are bacteria and fungi. 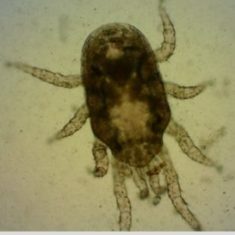 The predators prey upon the bacteria and fungi. Their predator-prey interactions are crucial to the processes of decomposition and the cycling of nutrients. Protozoa: Recognized primarily by their motion. They are defined more particularly as flagellates, ciliates and amoebas. Soil protozoa feed on bacteria. This keeps the bacteria communities healthy and growing by preventing overpopulation and overuse of nutrients, which would be detrimental to everyone in the soil community. As they digest bacteria, protozoa release excess nitrogen from the bacteria in plant available forms around roots. Nematodes: Distinguished by its worm-like appearance with pointed ends. They hold and recycle the nutrients present in the organisms that they feed upon. 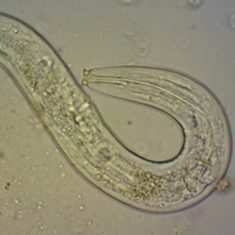 A trained observer can identify both beneficial and detrimental nematodes, which are distinguishable by their mouth parts. Microarthropods: Micro- meaning ‘very small’ and -arthropod meaning ‘having jointed legs’. Simply put, these are very tiny insects. They are at the top of the soil food web that is visible through the microscope. These creatures are food for larger predators such as earthworms and bigger bugs. Predator-prey relationships between microarthropods and other soil fauna are necessary to foster a complete food chain within, and beyond, the soil. Since different agricultural practices affect these complex communities in different ways, the microbiology of soil gives a peek into how farming practices are affecting long-term productivity—for better or worse. For example, when bacteria is found in low oxygen conditions, it is known that soil is becoming anaerobic. To remedy this problem, immediately aerate the soil. Being able to identify each of these organisms and certain indicator species can help make informed, real-time decisions about soils. How detrimental tillage and soil disturbances are to fungal networks? Do cover crops enhance diversity of microbial communities? How does soil compaction by tractors affect microbial communities? Could healthy microbial communities control weed-crop competition dynamics? In the end, the main goal is to create the ideal conditions in which these beneficial organisms can thrive. 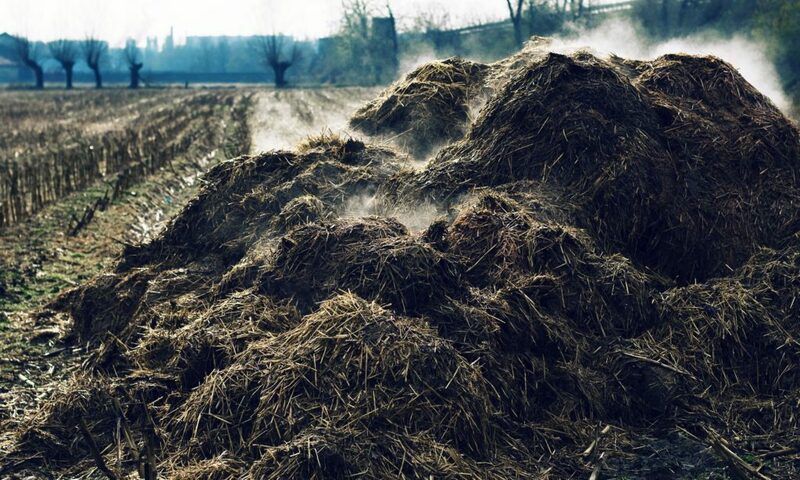 Researchers have begun working more in depth with the composting process to create the conditions for the ideal microbial community. Compost is an incredibly important and dynamic source of nutrient inputs and micro-biodiversity. Being studied are how different starting materials affect both the relative sizes of the microbiological communities and the amount of time it takes to make healthy compost. Pre-made compost products are also being analyzed to determine the microbiology they could potentially contribute through application. Though controlled inputs and monitoring techniques, compost must be produced and reproduced with the correct ratios of fungal to bacterial biomass that will support healthy crop communities. Beginning to use microbial research in conjunction with other ongoing projects will enhance the understanding of all systems and how microbiology affects each experiment. Nature has spent billions of years evolving and refining the essential set of functions known as sustainable farming. By encouraging the diversity and balance of appropriate soil ecosystems, farmers are able to enhance the productivity of their land, reduce or eliminate the need for pesticides and herbicides, improve water retention, reduce erosion and create healthy soils that provide for future generations. Applying techniques that bring about specific microbial communities requires education and understanding about the function of soil life. With an understanding, work with the natural processes of soil ecosystem—selecting those microbial communities that most fit agricultural needs. If interested in analyzing the micro-community in soils, a compound light microscope is a good place to start. Farmers around the country have begun purchasing this piece of equipment to do just that. Analyzing soil biology can be as simple as taking a daily or weekly sample and checking it under the microscope in order to make decisions based on the living contents of your soils. much appreciate new information on soil. Thanks for an article focusing on the critters. I can use this in my science classes.